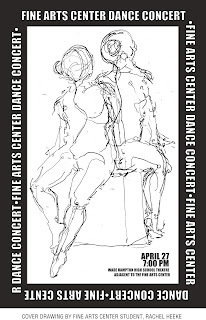 The Fine Arts Center Dance Concert will be performed Friday, April 27, from 7-8:30 pm in the theatre at Wade Hampton High School, adjacent to the Fine Arts Center. The repertory will include choreography by Brian McGinnis (Juilliard graduate and professional dancer with the Lar Lubovitch Dance Company in NYC), Gerri Houlihan (Professor of Dance at Florida State University and Co-Dean of the American Dance Festival at Duke University), Joan Wadopian (professional dancer with Shen Wei Dance Arts in NYC), Andrew Kuharsky (Director of the Greenville Ballet) and Rebecca Lee (MFA from Florida State University and alumna of the Fine Arts Center). This is going to be an extraordinary performance with a number of varied, intriguing pieces. 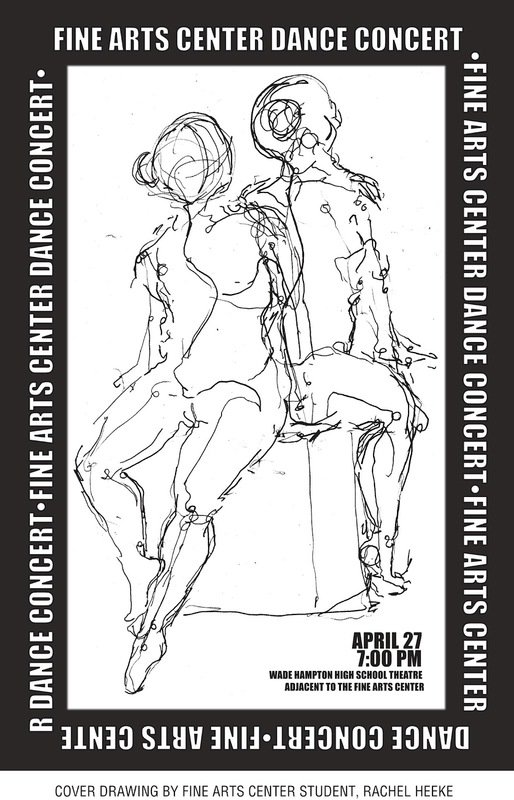 Don't miss this final dance performance of the school year! The Visual Arts Department at the Fine Arts Center invites you to the annual Spring Juried Student Exhibition Reception on Thursday, April 19, from 6:30-7:30 p.m. in the beautiful Sheffield Wood Gallery at the Fine Arts Center. Awards will be presented at 7 p.m. This year's exhibition was juried by Denise Woodward-Detrich, a ceramicist who specializes in functional pottery and is the director of the Lee Gallery in Clemson University's Department of Art. Said Ms. Woodward-Detrich, "It was a pleasure to spend my day reviewing the artwork and feeling the creative energy pulsing out from the various studios. The Fine Arts Center is ripe with creativity, energy, imagination, talent and excellence and is a wonderful environment for creative minds. The jury process was made difficult given the quality of the works submitted and enjoyable for the same reason. I enjoyed taking a close look at each of the submissions and found it challenging at the end of the day to limit my selections. " The Greenville Drive may be away this weekend, but you can get ready for their return next weekend! Let these talented FAC strings students put you in the mood with this entertaining performance of a ballpark classic, arranged by FAC instructor and Composer-in Residence Jon Grier. 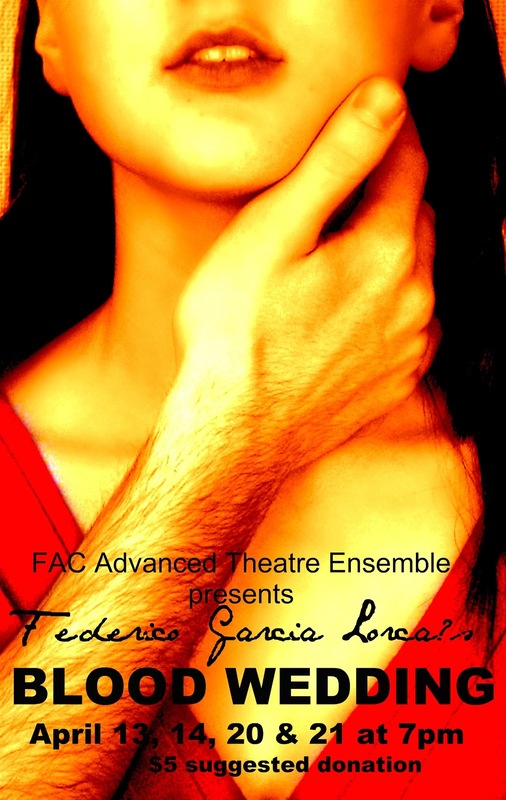 The FAC Advanced Theatre Ensemble will present Federico Garcia Lorca's "Blood Wedding" on April 13, 14, 20 and 21 at 7 p.m. There is a $5 suggested donation. This 1930s Spanish tragedy uses poetry, music, gypsy and flamenco influences to tell the story of forbidden love in rural Andalusian Spain. Original music and movement created by the Ensemble. Directed by Teri Parker Lewis. Alexis Aimé graduated from the Fine Arts Center in 2010, having studied in the voice and the theatre departments. She is now a sophomore at Oberlin Conservatory pursuing a BM in vocal performance. This past weekend she performed at TEDx Nashville singing Gretchen am Spinnrade by Schubert as part of a presentation on Classical Music. On April 16, she will perform (for the third time) at Carnegie Hall, singing Gretchen am Spinnrade and also Quando m'en vo from La Bohème. This summer she has been accepted into two summer opera programs: LA Operaworks and Atlantic Music Festival in Maine. See the video of the March 15 concert in honor of former FAC voice instructor Michael Rice. Hannah Peeples Won the Contest! Congratulations to FAC voice student Hannah Peeples for winning the BB&T This School's Got Talent contest. Hannah and her family would like to thank her FAC instructor, Karen Parks, as well as the other staff and faculty at FAC who have been so instrumental in her success. They would also like to thank everyone who voted on Facebook. Way to go, Hannah!